Beijing will launch a real-name registration system for fireworks sales for the upcoming 2019 Spring Festival, a latest move for the city to enhance firework management. "Every fireworks store will be equipped with equipment to read the customers' identification cards. We can trace the buyer in case of an accident," Tang Mingming, deputy director of the Beijing Emergency Management Bureau, told The Beijing Youth Daily. The number of fireworks stores in the city will be reduced from more than 80 in 2018 to just over 30, Tang said. 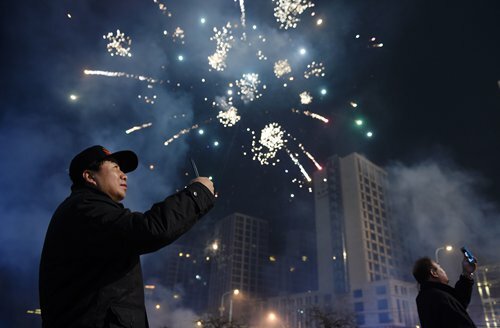 Fireworks booths will be banned in Beijing's sub-center this year, Tang said. Fireworks will be sold from January 30 to February 9. Beijing started banning fireworks sales within the Fifth Ring Road at the end of 2017 to reduce pollution and for safety reasons. A total of 122,000 boxes of fireworks were sold in Beijing during the week-long 2018 Spring Festival holiday, down 30.3 percent from the same period in 2017, the Xinhua News Agency reported. The reduced fireworks sales led to fewer injuries. Only 81 people were hurt in the first six days of the holiday, a 21.4 percent drop from last year. Beijing assigned 73,100 policemen, medical workers, firemen and volunteers for fireworks-related emergencies last year on the fifth day of the Spring Festival, which is traditionally considered a halt to the revelry and often celebrated by setting off more firecrackers and fireworks, said Xinhua.